Concrete Art imprinted and colored this floor for a pub in the historical centre of Bucharest. We receive project submissions from concrete contractors on a weekly basis. However, it is not very often that we receive submissions from abroad, let alone Romania. But, the other day we did in fact receive just such a submission. Concrete Art, a company specializing in stamped or imprinted concrete, is based in Bucharest, Romania. 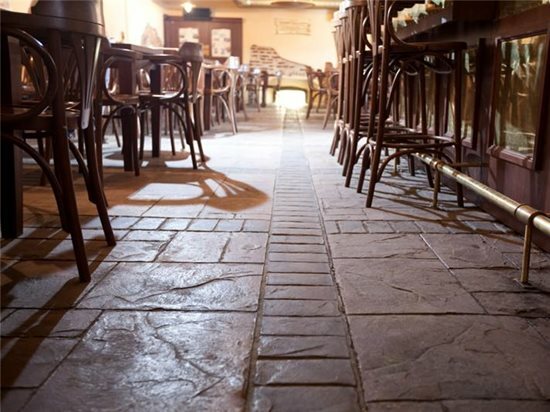 They recently submitted photos of an interior stamped concrete floor that they completed for a local pub. The floor was imprinted with a grand ashlar pattern and colored with a combination of cream, maroon and brown. 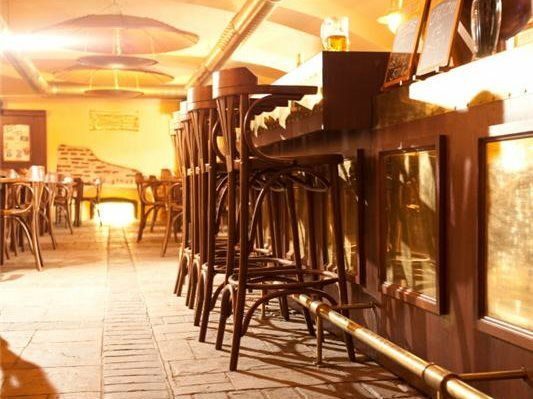 The pub, Curtea Berarilor, which means Brewer's Courtyard, is situated in the historical center of Bucharest. Concrete Art installed an imprinted concrete floor in the pub, creating the feel of an old world tavern. A grand ashlar stamp pattern was used to mimic the look of slate. A brick-like pattern intersects the grand ashlar for added design interest. The concrete was colored with a cream color hardener, a maroon release agent, and a brown acid stain. Bucharest is an Eastern European city that has a complex history marked by natural disasters, wars and revolutions. However, in recent years Bucharest has experienced significant economic growth. As a result, the city is undergoing a period of urban renewal and modernization. A number of residential and commercial development projects are underway in the northern districts. Bucharest's historic centre is also undergoing extensive restoration. The Curtea Berarilor pub project is a great example of such restoration. Decorative concrete, like that provided by Concrete Art, is perfect for recreating an authentic, traditional feel, but with a modern and durable product. Concrete Art has been in business since 2006. They got their start attending trainings and learning to use Ideal Work products. While their specialty is imprinted concrete, they have also been offering stained concrete, micro-toppings and decorative epoxy floors for the past year. Concrete Art has completed a handful of high profile commercial jobs; however, a majority of their work is residential imprinted concrete driveways, patios and pool decks.